Wow! In my walk in Forest Park this morning I was shocked and amazed to hear and then see a Pileated Woodpecker! They are not at all expected in Queens, and though I have seen Red-bellied Woodpeckers, Downy Woodpeckers, Hairy Woodpeckers, Yellow-bellied Sapsuckers, and Northern Flickers in Queens I had never spotted a Pileated Woodpecker in New York City, much less in Forest Park. Not only that, but I managed to get a decent picture! 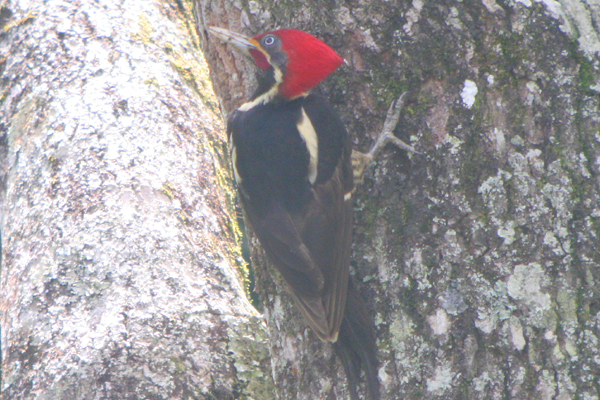 What’s more amazing is that I went through eBird’s records and there are no records of Pileated Woodpecker from Queens at all, though Bull’s Birds of New York State says that there was a female, found by Bernarth in Forest Park in December, 1981. The bird stuck around until May of 1982 and I’ve apparently found the first one since. What a way to start a day and the month of April! Bonus: Some great video of a Pileated Woodpecker can be seen here. I am sure you will send that picture to Cornell, ey? You know, those two white lines on the back, … it might be a hybrid with the other really large black-and-white North American woodpecker, or not? wow Corey… nice find!!! Thanks a lot for the phone call telling me about it… I know I had neglected to get back to you recently, but really, you should still share! Where specifically was it? and what time? @Jean: Your sarcasm is only overcome by my perfidy. I’ll be calling you about…now. I was already planning on going to Forest Park today. I’ll keep an eye out for the pileated woodpecker. ok, I guess I deserved to fall for this… it was a good set-up, because I know there was a previous record of PIWO in Queens. And it is finally spring, which means there should finally be birds! I know you’re Lineated and I’m gonna say it. Never gonna give you up, never gonna let you go, never gonna run around, and April Fool ya! and stayed on for longer than I care to admit. @Nate, Jean, Patrick, Kallen: Ha! April Fools! Congratulations on seeing a Phoebe Corey! Corey I went over there today and saw the bird and it gave me the finger ?? Wait a minute – is this really a Pileated Woodpecker? It sure does not look like a Pileated Woodpecker! Notice 1) the black barring on beige background of underparts, 2) the all pale bill, 3) the facial pattern with backish grey face and no white behind the eye, 4) the extent of the red down onto the lower nape and 5) the white on the back. These are features of Lineated Woodpecker (also check some of the other Neotropical woodpeckers) and NOT Pileated Woodpecker – maybe an escape from the Bronx zoo?? Oh – now i see what’s going on – sorry – i guess i should have read other people’s comments before posting – my excuse is i received this on April 2nd! I don’t think it’s right to post hoaxes. @Joseph: You got my email too, right? @christian: Happy April Fool’s Day! @Seth: I understand where you are coming from…but April Fool’s Day is irresistible to me. So far as I can can tell no one actually went after the bird so my opinion is no harm, no foul. And I have received one nasty email about this, so you are not the only one. Pure Florida had a great joke going as well – meteor strike – elaborate videos.